Today’s post is all about Health and Wellness. In the modern lifestyle, people are least concerned about the water they drink and use. Most of the tap water, bottled water, Reverse Osmosis water and distilled water contain acidic pH that causes our body to become more acidic. The water we consume has a positive ORP. Minerals in water are an easy way to improve this balance within our bodies. The water that we choose to drink is impacting our body’s pH levels. If you and family are suffering frequently from health problems such as acidity, headaches, fatigue, constipation, immune dysfunction and premature ageing then you really need to switch your water system to Hydro-Jal Plus. 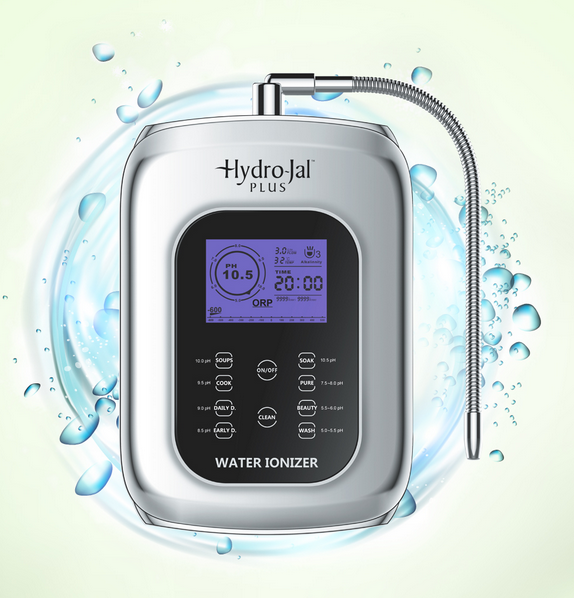 Hydro-Jal Plus is India's most advanced, compact, stylish & affordable water ionizer. It is the most efficient, fully featured and powerful, high quality ionizer in the country. It converts regular water into absolutely healthiest ionized alkaline water. Alkaline water has antioxidant properties that counteract free radicals. Free radicals can cause pre mature ageing and other types of health problems. Reverse osmosis or purified water is free of dissolved minerals and, because of this, has the special property of being able to actively absorb toxic substances from the body and eliminate them. Studies validate the benefits of drinking purified water when one is seeking to cleanse or detox the body for short periods of time (for a few weeks at a time). Fasting using purified water can be dangerous because of the rapid loss of electrolytes (sodium, potassium, chloride) and trace minerals like magnesium, deficiencies of which can cause heart beat irregularities and high blood pressure. Cooking foods in distilled water pulls the minerals out of them and lowers their nutrient value. Purified water is an active absorber and when it comes into contact with air, it absorbs carbon dioxide, making it acidic. The more purified water a person drinks, the higher the body acidity becomes. According to the U.S. Environmental Protection Agency, "Purified" water, being essentially mineral-free, is very aggressive, in that it tends to dissolve substances with which it is in contact. Notably, carbon dioxide from the air is rapidly absorbed, making the water acidic and even more aggressive. Many metals are dissolved by distilled water. It is always best to opt for alkaline water. • Super hydrates our skin. • Restores pH balance in our body. • Reduces joint and muscle pain. • Increases blood oxygen levels and circulation. You can also request a free Hydro-Jal Plus product demo at your place that also includes testing of acidic level of your drinking water by filling the form provided on the website. There are many health benefits associated with drinking alkaline water so if you are facing any health issues switch to Hydro-Jal Plus that is indeed a boon for your loved ones! Have you tried Hydro-Jal Plus? What are your opinions? Share in the comments section below!